They are just gorgeous!! Love them! these are beautiful and so well done. 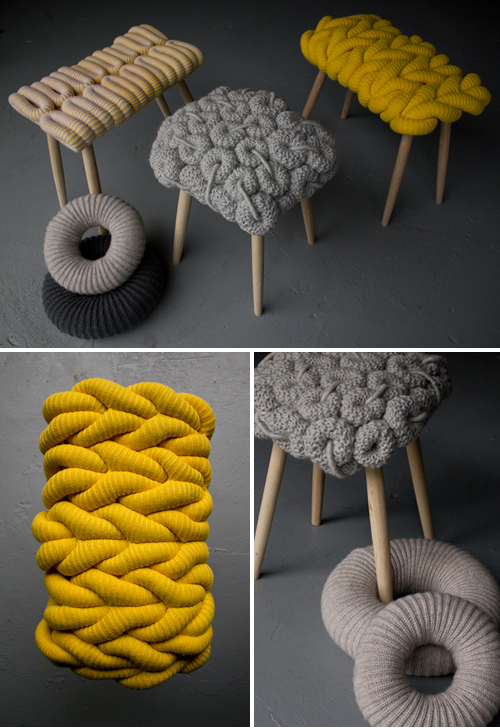 Okay, when I look at these stools , I don’t think knitting is just for grandmas anymore. Very creative! so fun! i think i’d want one in my bedroom or maybe office. friendly aside to dianna…knitting hasn’t been just for grandmas for a long time now :)… there’s a whole new generation of fashionable knitters are on the scene making lots of cool stuff like this. anyhoo, what a great find…i think i have a pattern somewhere for knitted scrunchie shapes like the ones in grey. love how they’re all looped together.